Spanish property prices fell by 5.3% over 12 months to the end of March, according to the property price index published monthly by Tinsa, one of Spain’s leading appraisal companies. This represents a slight improvement for the national index since last month, suggesting that a weak trend towards price stabilisation is still on track. Price falls were steeper in the 2 areas that interest holiday-home buyers the most, namely the Mediterranean coast and the Islands. Having lurched back down by 8.2% over 12 months to the end of February, prices on the coast recovered a bit to fall 7.8% to the end of March. 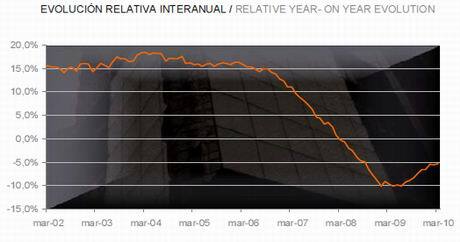 In the Balearics and Canaries, prices were down by 5.7% over 12 months. On a peak to present basis (since prices peaked in December 2007), prices are down 16.2% nationally, 22.5% on the Mediterranean coast, and 13.6% in the Canaries and the Balearics. As always, I need to point out that Tinsa’s figures are based on their own valuations, not actual transaction prices. They may be, probably are, quite wide of the mark. Nevertheless, they are interesting in what they reveal about trends, and the valuations used by banks for mortgage lending purposes.